This unit is a five (5) stage RO/DI (Reverse Osmosis/De-Ionizing) reef keeping system using a 100gpd (Gallons Per Day) FilmTec membrane for truly great water quality and production rates. 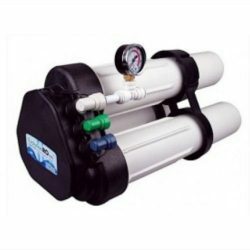 Stage 1 Heavy duty, standard industry size 10 micron Poly Pro sediment filter. Stage 2 5 micron acid washed* Gem coconut carbon block filter, removing 98-99% of chlorine. 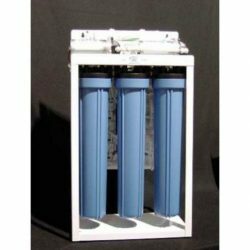 Stage 3 1 micron acid washed* Gem coconut carbon block filter, that removes the remaining chemicals and chlorine. 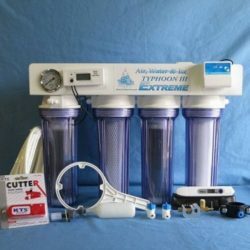 Â This filter is rated for 9,000 gallons and strips the remaining 1-2ppm (Parts Per Million) chlorine per gallon. Stage 4 A 100gpd FilmTec membrane removing 90% TDS (Total Dissolved Solids). Stage 5 A 2.5 X 11″ mixed bed DI filter.